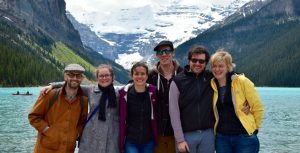 Grad Students at Lake Louise after the Canadian Philosophical Association meeting in Calgary, May 2016. Every full-time graduate student we admit is guaranteed financial support for the prescribed duration of the program. This support fully covers tuition, fees and health insurance, and also includes funds for living expenses. Full funding is extended to all admitted students, whether domestic or international. Students are also eligible for up to $1,600 per year in travel funding to present their research at conferences and workshops. Visit the Arts & Science Graduate Funding Facts page. MA students are guaranteed funding for the one-year duration of their program, and PhD students for five years, unless they have been admitted to the four-year PhD, in which case they are guaranteed four years of funding. The minimum University guaranteed level of funding is presently equal to the full cost of tuition with all incidental and health care fees, plus at least $18,000 (MA students) and $22,500 (PhD students). This is a minimum, with the possibility of funding that goes considerably beyond this minimum available through competitive scholarship awards and other supplemental funding. This pushes average funding close to $26,000, with the possibility of further income in the form of additional teaching assistantships and summer instructorships. No special application is needed for these awards, which are allocated annually. In addition, until the year 2019, the Department of Philosophy has exceptional funding from the Balzan Prize Foundation, in connection with the Styles of Reasoning Balzan Prize won by University Professor Ian Hacking in 2014; the bulk of this funding will be used for graduate student support. The Department of Philosophy considers the holding of a teaching assistantship to be an integral part of the professional training it provides in its graduate programs. In the PhD program, the level of responsibilities associated with these appointments progresses with increasing seniority. Typically, the student begins as a grader of tests and essays in undergraduate semester courses, then serves as a tutorial leader in a large year-length introductory course, and finally becomes responsible for teaching a course. Specific assignments are made by the TA Coordinator. Rates of pay and conditions of appointment for teaching assis­tants are determined by a collective agreement between the University and the graduate students’ chapter of the Canadian Union of Public Employees (CUPE). Students who do not complete their degree during the period of guaranteed funding remain eligible for TA assignments, but with lower priority. Because the Faculty of Arts and Science provides guaranteed funding in the form of University of Toronto Fellowships, each student is required to apply for funding from sources outside the University of Toronto. Where an application for external funding is successful, the University of Toronto component is reduced accordingly. The two principal external funding sources are the Social Sciences and Humanities Research Council of Canada (SSHRC) and the provincial government of Ontario. SSHRC offers two doctoral awards, valued respectively at $20,000 per year for one to four years, and $35,000 for three years. Only Canadian citizens and landed immigrants are eligible. (Students applying for the MA program are not eligible for this award). Details are available in the Graduate Office in early October or on the SSHRC website. Domestic and international students in our program are eligible for the Vanier Award, valued at $50,000 per year for three years; details are available on the Vanier CGS website. Toronto Philosophy has a strong record of winning these awards: we’ve had a winner every year for the past three years. The OGS is valued at $15,000 for one year; domestic and international students are eligible. Last year 11 Toronto graduate students won OGS awards. As part of its admissions process, the Department nominates annually a ranked list of PhD applicants for a variety of fellowships managed by the School of Graduate Studies. Major awards for international students include the Connaught and Trillium Fellowships; the department nominates candidates for these awards as part of the admissions process, and no special action on the part of applicants is required. For information about the SGS fellowships, see the relevant SGS website. The School of Graduate Studies has established an Emergency Grant to help currently registered students meet financial emergencies. The Emergency Grant was previous known as the SGS Bursary. Details of eligibility, application process and application forms are available from the SGS website. Only students registered as graduate students in the Department, and who are in good standing, are eligible to apply for travel funding. Students may be reimbursed for a maximum of 2 conferences per year (September 1 – August 31), with a maximum of $800 per conference from the general departmental fund. Students wishing to apply for these funds must do so in writing, using the Travel Funds Request Form.